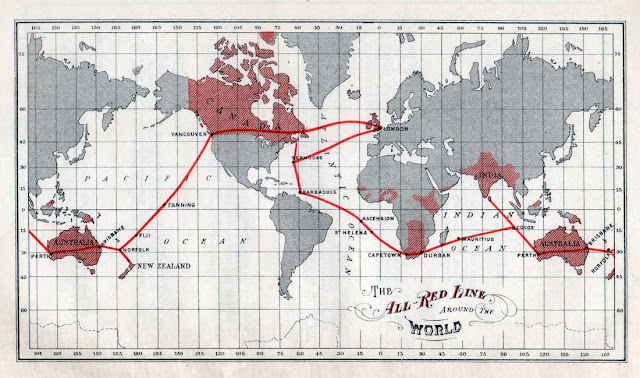 During early 1900s, British long-distance telecommunication relied on the “All-Red Line”, the network of British-controlled and operated electric telegraph cables stretching around the globe and so called due to the colour red (or sometimes pink) being used to designate British territories and colonies in the atlases of the period. News which had previously taken up to six months to reach distant parts of the world could now be relayed in a matter of hours. In 1902 the “All Red Line” route was completed with the final stages of construction of the trans-Pacific route and connected all parts of the British empire. In 1902 and around the time that the All-Red Line was completed, the Committee of Imperial Defence was established by the then British Prime Minister Arthur Balfour and was made responsible for research and some coordination of British military strategy. In 1911 and with the possibility of a war in Europe looming, the committee analyzed the All-Red Line and concluded that it would be essentially impossible for Britain to be isolated from her telegraph network due to the redundancy built into the network: 49 cables would need to be cut for Britain to be cut off, 15 for Canada, and 5 for South Africa. Further to this, Britain and British telegraph companies owned and controlled most of the apparatus needed to cut or repair telegraph cables and also had a superior navy to control the seas. As a result, when war broke out in August 1914 and some isolated telegraph stations such as the one at Cocos Islands asked for further security and military protection due to the risk of German attack, they got none and were left to their own devices in terms of protection. Some of the staff on the Cocos Island station constructed a fake telegraph cable and this was one that was cut by the Germans in their attack on the island in November 1914 and so telegraph communication via this telegraph station was able to continue. A few facts put this dominance of the industry in perspective. In 1896, there were thirty cable laying ships in the world and twenty-four of them were owned by British companies. In 1892, British companies owned and operated two-thirds of the world's cables and by 1923, their share was still 42.7 per cent. During World War I, Britain's telegraph communications were almost completely uninterrupted, while it was able to quickly cut Germany's cables worldwide. Dr.Elizabeth Bruton is postdoctoral researcher for “Innovating in Combat”. 3. Johnson, George. The All Red Line; the annals and aims of the Pacific Cable project. Ottowa: James Hope & Sons, 1903. Available via Internet Archive. 4. Kenndy, P.M. Imperial Cable Communications and Strategy, 1870-1914, The English Historical Review, Vol. 86, No. 341 (Oct, 1971), pp. 728-752. Available via JSTOR.